July 2nd to July 26th. Reception Friday, July 4th 6-8pm. July 28th to August 30th. Reception Friday, August 1st 6-8pm. * Elizabeth Ferchuk Solo Show: "Enchanted by the Seasons". September 1st to September 27th. Reception Friday, September 5th 6-8pm. September 29th to October 25th. Reception Friday, October 3rd 6-8pm. November 3rd to November 29th. Reception Friday, November 7th 6-8pm. * Gallery IS Group Show: 3rd Annual Miniatures Exhibit. December 1st to December 31st. Show Preview Sunday November 30th, noon - 3pm. The Gallery is closed Jan 1st -4th. This schedule is subject to minor changes. Open call to all artists. We are now accepting submissions for our 2nd Annual Miniatures Show and Sale. This is an exciting show centering around miniature works of art. This show takes place over the Christmas holidays and is a great opportunity for gift buying. All media are acceptable. Professional, emerging, and student work will be considered. Submitted 2D works must be 5x7 or 6x6 inches, and below. 3D works must be 6 inches or less in hight and width. A maximum of 3 submissions per artist please. If accepted we can showcase up to 10 pieces in the show. The deadline for submissions to the Gallery's miniatures group show has been extended to Nov 16th. Notice of acceptance will be given by Nov 18th. Delivery of accepted artwork must be made by Nov 23rd. SUBMISSION FEE FOR ENTRY IS $5.00 PER ARTIST. Official show dates are Nov 26th to Dec 24th, 2007. The show might be held over after christmas for Boxing Day shoppers. All submissions must be made to the Gallery IS. Submissions can be made via email. Call us for more info or if you have any questions (403) 341-4641. The Gallery IS, is presenting a new body of work by Alberta artist Marie Banville. Please visit the gallery to view the amazing encaustic paintings by this unique artist. 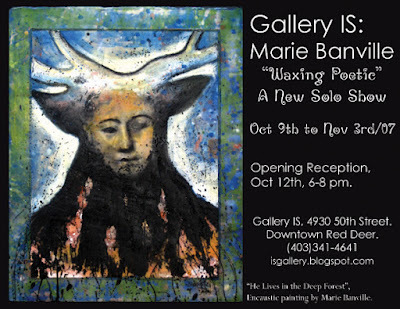 Opening Reception - October 12th, 6-8 pm. Gallery IS hopes everyone has a safe and happy Thanksgiving. What a wonderful time of year for food, family and friends. Special gallery hours for this long weekend. Saturday Oct 6th - Noon to 4:00pm. Monday Oct 8th - Closed. The gallery will return to our regular hours on tuesday.